The Nippon Professional Baseball commissioner’s office on Aug. 9 released the results of its recent survey whereby current players, coaches and managers selected the greatest games and most memorable moments in the 76 years of Japanese professional baseball history. In the best game category, the winner was the dramatic Oct. 8, 1994, contest between the tied-for-first-place Yomiuri Giants and Chunichi Dragons at Nagoya Stadium. The winning team would win the Central League pennant, and the Giants took it, 6-3, then went on to defeat the Seibu Lions in a six-game Japan Series. No. 1 in the best moment category was the Oct. 21, 2009, come-from-behind, game-ending, grand slam home run by Terrmel Sledge at Sapporo Dome to give the Nippon Ham Fighters an incredible 9-8 victory over the Rakuten Eagles in Game 1 of the Pacific League Climax Series. Nippon Ham had gone into the bottom of the ninth inning trailing 8-4, and this was also listed as No. 4 in the greatest game category. • A 6-5 victory by the Kintetsu Buffaloes over the Orix BlueWave on a pinch-hit, come-from-behind, walk-off grand slam to win the Pacific League pennant by Hirotoshi Kitagawa at Osaka Dome on June 26, 2001. • The Nippon Ham Fighters’ thrilling 1-0 sayonara win over the Fukuoka Softbank Hawks to clinch Stage 2 of the Pacific League Climax Series at Sapporo Dome on Oct. 12, 2006, sending manager Trey Hillman’s club to the Japan Series. It also meant J.S. games would be played for the first time on the island of Hokkaido. • The combined perfect game thrown by Chunichi Dragons pitchers Daisuke Yamai and Hitoki Iwase in the clinching Game 5 of the Japan Series against the Nippon Ham Fighters at Nagoya Dome on Nov. 1, 2007. • The Yomiuri Giants’ remarkable comeback in their final home game of the season on Sept. 24, 2000. 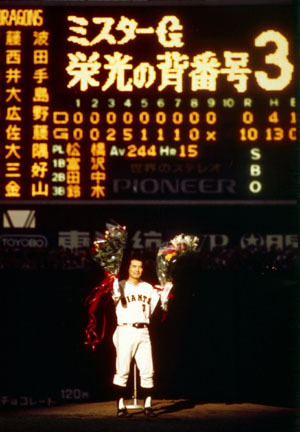 With a magic number of one, the Giants had to beat the Chunichi Dragons to clinch the Central League pennant — or win the flag on the road. Trailing 4-0 in the bottom of the ninth, the Giants loaded the bases against Dragons relief ace Eddie Gaillard, and veteran Akira Eto’s grand slam tied the score. One batter later, Tomohiro Nioka hit a sayonara, pennant-winning homer, suddenly sending the Yomiuri fans into a celebration before a shocked Chunichi club. • The professional debut of then-19-year-old pitcher Daisuke Matsuzaka for the Seibu Lions against the Nippon Ham Fighters before a crowd of better than 44,000 at Tokyo Dome on April 7, 1999. • The first head-to-head confrontation between Matsuzaka and Orix BlueWave batting star Ichiro Suzuki at Seibu Dome on May 16, 1999. • A 14-pitch at bat with Yakult Swallows slugger Tom O’Malley facing Orix BlueWave right-hander Hiroshi Kobayashi in Game 4 of the Japan Series on Oct. 25, 1995, at Tokyo’s Jingu Stadium. O’Malley kept fouling off pitch after pitch, including a couple of shots that had home run distance but just missed the pole. Kobayashi won the game 2-1, but the Swallows took the Series in five games, and O’Malley was named MVP. • Back-to-back-to-back center field back-screen home runs hit by the Hanshin Tigers trio of Randy Bass, Masayuki Kakefu and Akinobu Okada off Yomiuri Giants right-hander Hiromi Makihara at Koshien Stadium on April 17, 1985. The three drives flew over the head of frustrated Yomiuri center fielder Warren Cromartie. The Tigers won that game 6-5 and seemed that night to gain the confidence and momentum that would eventually carry the club to its first Central League pennant in 21 years and first-ever Japan Series title. • Sadaharu Oh’s 756th career home run, breaking Hank Aaron’s world record, at Korakuen Stadium in Tokyo on Sept. 3, 1977. While the results of the survey are interesting, it should be noted it was taken among current NPB managers, coaches and players, and all but four of the 20 best games and moments selected occurred within the last two decades, and there is nothing before the Oh reference in 1977. There were many more great games and instances from the first 56 years of Japanese baseball but, of course, most of those who responded to the survey had not been born yet and do not remember them. 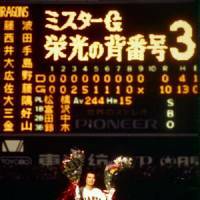 Surprisingly absent from the list of Top 10 moments for me is the Oct. 14, 1974, tearful retirement speech given by Yomiuri Giants popular star Shigeo Nagashima, who spoke to the crowd at Korakuen Stadium following his last game played against the Chunichi Dragons. “I have felt my limitations,” the then-38-year-old Nagashima told the fans over a stand microphone placed in the center of the diamond. Surely this marked the end of an era that will never be forgotten. In one event that goes back even before my time in Japan, Nankai Hawks right-hander Joe Stanka pitched consecutive shutouts in Games 6 and 7 of the 1964 Japan Series to give his club the crown over the Hanshin Tigers. Stanka had also shut out the Tigers in Game 1 by the score of 2-0. In Game 6, the Oklahoma native whitewashed Hanshin 4-0 on Oct. 9, and he once again blanked the Tigers in the finale, winning 3-0 the following day. All three games were won on the road at Hanshin’s Koshien Stadium. Another super-human effort in the Japan Series was turned in by Nishitetsu Lions hurler Kazuhisa “Ironman” Inao who won Games 4, 5, 6 and 7 in 1958 to secure the championship for his club over the Yomiuri Giants. Speaking of ironmen, how about Hiroshima Carp infielder Sachio Kinugasa, who in 1987 broke Lou Gehrig’s record 2,130-game consecutive playing streak? These are entries that would be on my list.